Riding through no less than five countries on this stage from the Adriatic to the Aegean Sea, from one great city of the Mediterranean to another we weave a path through these ancient land steeped in history and legends. Go one up on your cycling buddies - ride Croatia, Montenegro, Albania, Macedonia, and Greece - all in one trip! A-M-A-Z-I-N-G :-) it's truly one of our favourite adventures! Get ready for an amazing ride that has it all - beautiful coastline, ancient history, a whiff of recent historical events, and incredible undiscovered landscapes. We are exploring Europe's hidden frontiers, and meeting folks at the roadside who don't see Northern Europeans all that often - especially not on 2 wheels ! Albania, Montenegro and Macedonia are all on the current 'hot list' of exciting new destinations - visit now - before its all change on the Eastern front. This is an adventure ride in the true meaning of the word, and accommodation will be a mixture of simple hotels & B&B's throughout the event (including buffet breakfasts). The standard of accommodation will fluctuate throughout the trip - but is designed to be functional - and to enable us to get a good night's sleep - and continue with the challenge. You will be sharing in twins or triples. If you require a single room then please request this at time of booking (a small supplement will be payable). Upgrades may be available for an extra charge if required. 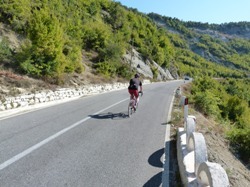 This trip includes one night in Dubrovnik prior to the ride, and the night at the end of the ride in Thessaloniki. You will need to fly your own bicycle to this event - and you should ensure your bike is ready for mixed roads - rural Albania has variable road conditions! Please pack your bike carefully - and you must use a soft case. You should hold a valid passport for this event - Please check your passport validity! If you are unsure if your passport is valid to travel through the countries stated in this challenge please contact the Home Office for advice. Collection from Dubrovnik Airport, 7 nights accommodation (B&B), cycling leader/mechanic, first aider, team tools and spares, support vehicle & driver. The trip will also include the production of a photo DVD of the trip which will be available to participants for a nominal production and postage fee. By nature all activities contain an element of risk.Your leader will be first aid qualified and will carry the appropriate safety kit for the activity, such as first aid kits, and from time to time mobile radios. Safety equipment carried will be appropriate to trip. The leader's primary role is to ensure your safety, but it is your responsibility to listen to their guidance and instructions. On any cycling itinerary you should take great care on the road - cycling single file wherever possible, avoiding the use of earphones, and wearing a helmet at all times whilst riding. We hope to experience some pleasant Mediterranean warm weather - although, as ever, be prepared for all kinds! Typical weather stats for Dubrovnik and Thessaloniki in September/October suggest average daily maxima of between 22 and 25 degrees. As we crest the final pass to Lake Ohrid, the temperature could dip - so be ready with some warm layers - and of course - there's a chance of rain... however unlikely!